Drop Mitch is a variation of the popular Mitch strat where you sub out one or more camps of Beta Minions/Drop Ships with two camps of Night Witches. The army comp I typically use is 3 camps Beta Minions, 2 camps Night Witches, 1 camp Drop Ships. As is the case with every good attack strategy, each troop has a different role to play in a successful attack. Night Witches - Their primary function is to generate Bats, but they often also break a hole into the wall of a long apron or elsewhere on the base. Of course, they also do quite a bit of damage on their own. Bats - Distraction and destruction are the key roles here. Beta Minions - Seek and destroy; Beta Minions are the primary source of destruction on the base, targeting first decoy structures outside the base then air defenses as well as everything along the way. Drop Ships - Tank and distract. Drop Ships soak up the enemy defenses to provide a protected space for the Beta Minions so they can take down key air targeting defenses. The attack strategy itself is very methodical - I would say it has a runbook all its own. First, use a handful of Beta Minions to eliminate decoy structures around the outside of the base. These structures are there to distract inbound troops, pathing them around the base rather than through it, and enabling ranged defenses to take them out. Some players will destroy all of these structures while others will only eliminate those that are in the general path of the Night Witches. Next, drop your Night Witches in a cluster at one end of the base. This will have the net effect of creating a swarm of Bats. Ideally, you’ll use this strategy against a diamond base and have a long run between the corner and the first wall of the base. As the Bats work their way in, they will attract air targeting defenses and take out periphery structures (often defenses) as well. The next step is a matter of style and design - either drop the Drop Ships or the Beta Minions. Many players will place their Beta Minions first, running them at a 90 degree angle to each other along the apex sides of the base. You can usually deploy the Beta Minions before the Drop Ships, but only if their Long Shot will keep them alive long enough to deploy your tanks. Finally, deploy the tanks - your Drop Ships. More oft than not, this will be one on either side of the apex angle but there may be times when you will put them in a line, such as if you are coming from the side of the base that is at the far end of run up to the BH itself. Timing the Battle Machine can be a bit trickier. You want the BM to attract ground defenses with the goal of keeping the Night Witches alive as long as possible. The longer they survive, the more Bats they can throw at the base. However, if you deploy him too soon or too close to the Night Witches themselves, he’ll go down quickly and the Night Witches may actually be caught in the crossfire. I usually drop him just in front of the Night Witches as they are nearing the point that will take them into the base. If they’re blasting through a wall, that’s right before the wall opens; if there is already an opening, it will be as they get to about an inch or two away. However, if a ranged defense survives the initial attack squad, you’ll want to get the BM in there sooner so that he gets the bulk of defensive fire and not the Night Witches. This is especially the case with MultiMortars positioned to the outside of the core that do not get taken down by your initial attack. Choosing your attack vector is largely dependent upon where the base is placed on the game grid. You want to give the Night Witches and Bats as much time as possible to damage the 2nd ring buildings as possible. If the base is at the bottom of the grid, you’ll end up attacking from the top of the grid (vice-versa, left/right, right/left…you get the gist). Most of the time, you’ll want to attack the angle of the base where the BH is located; coming in the long way is usually a high risk, high reward attack - if it goes well, it will go VERY well but if it goes sideways, you may not even get a star. If the base is centrally positioned, I usually avoid using this strat unless both the Air Bombs and MultiMortar are right up against one side of the base. In the end, the key to being successful with this strat is timing, timing, timing. If you drop your troops too soon, the attack will easily fail. For example - a Drop Ship placed after Beta Minions are targeted by the AirBombs is often the end of the attack. The best bases to use this against are diamond bases. It will work against some sidewinders, box, and bracket bases but it’s usually best suited to a diamond base. This is because of the general design of such bases - the BH is at one end and, often, key defenses are reachable early on. The longer it takes your troops to reach defenses that will bring about mass destruction (AirBombs, MultiMortar), the greater the likelihood it will fail. 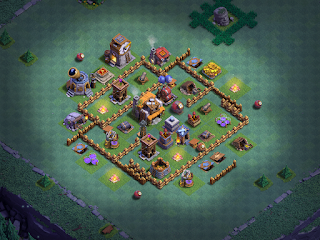 Defending against this attack is the same as defending against all Night Witch strong attacks - hidden defense placement (especially MegaMine), centrally located key defenses (MultiMortar with lots of buildings between the approach path but with ability to hit into the attack vector), and/or something that will slow down the approaching troops. Surprisingly, clustered air defenses is not the answer here. Now, the big question - does this work at BH8? The answer is…sometimes. Every attack strategy will work at BH8 under the right conditions. This is where you’ll have to analyze the base. I’ve had this strat work great against fully maxed bases and…i’ve had it crash and burn miserably against near-max bases. One well placed MegaMine will quickly end the attack and you can’t tell where they might be, so there’s always a risk here. One of our regulars has been using this strat quite a bit at BH8, including in the run up to 5000 trophies. He was kind enough to provide me with some replays (three of the are 3-star wins to boot) from the end of the last season. I put these into my companion video for this article; it’s linked below. The nice thing about his attacks - the bases are all BH8 maxed defenses (only walls aren’t upgraded and since this is largely an air attack, that’s not a factor). You can really see the step-by-step in his attacks. I’ve also included a link to a video I did a few months back, early into BH8.